In this miniature, the three wise men who followed the star of Bethlehem from the east pay homage to Christ. In the Middle Ages, artists and authors traditionally represented the wise men as kings with individual names and characteristics. 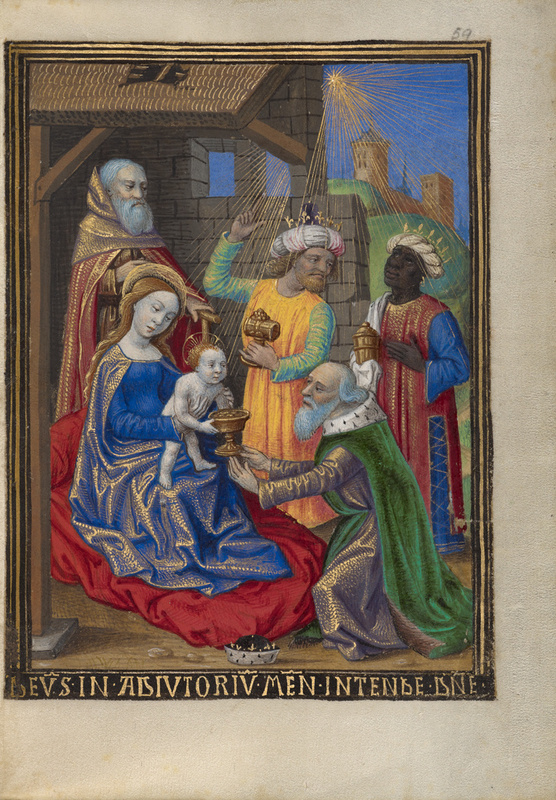 Caspar, the oldest, kneels before the Virgin and Child and offers a gift of gold, while Melchoir, the youngest, points out the star to Balthazar, represented as a black man following late medieval custom. Each of the gifts offered to Christ had symbolic value in the Middle Ages: gold in homage to Christ's kingship; frankincense, an oil used in worship in ancient times, in honor of his divinity; and myrrh, used in embalming, foreshadowing his death. In the later Middle Ages, the Magi often personified the three parts of the known world (Africa, Asia, and Europe); their facial features and dress in this miniature suggest this interpretation.